Wall Street & London elite lay groundwork to justify large scale destabilization in Russia. 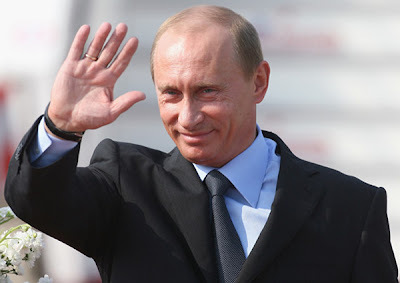 March 5, 2012 - As predicted - the Western media and US State Department-funded "opposition" inside Russia have called Vladimir Putin's landslide victory a "fraud." It was stated on Thursday March 1, that the Western media had "already determined how Russia's elections will unfold, creating the pretext in the minds of impressionable viewers to justify the unrest the US is undoubtedly planning." Image: Despite every poll indicating well in advance an easy victory for Vladimir Putin, and his critics admitting mobs of anti-Putin protesters constitute but a minority, claims of "election fraud" are rife across Western media. Clearly a man sure to win is not going to taint his victory by needlessly cheating. Conversely, in Thailand, when convicted criminal Thaksin Shinawatra ran for office by proxy through his own sister, and squeaked by with a tenuous victory, the Western media hailed it as a triumph of democracy. The difference? Thaksin Shinawatra of Thailand works for Wall Street, Vladimir Putin does not. This is similar to what took place during the 2009 Iranian elections where US State Department-funded opposition groups also claimed the elections were "illegitimate" and took to the streets in an attempt to reverse the democratic process through ochlocratic means. In Egypt, directly before the US-engineered Arab Spring, elections that predictably overlooked the suspicious Mohamed ElBaradei were likewise called "fraudulent" and used as the rhetorical justification to execute destabilization long-planned by the US State Department since 2008. Proceeding Thailand's July, 2011 elections, as explained in ""Stolen Elections" Battle Cry of the Color Revolution," Wall Street and London's operatives laid the groundwork to likewise call any result aside from their proxies' full installation to power "fraud," to then be used as impetus to justify street mobs, destabilization, and violence. "Even if the system delivers the required results, clear evidence of rigging may lead voters to reject the election as unfair and illegitimate. Moreover, the authorities' stifling of the Russian public's voice runs the risk of creating an even more combustible environment in the period after March 4. The balloting, whatever its outcome, is therefore unlikely to extinguish the rising desire for real change. Unless and until that change is permitted, Putin's continued pursuit of simulated democracy will fail to achieve even a simulation of stability." Kramer's veiled threats of instability brought about by the opposition he, his Freedom House organization, and its parent organization, the National Endowment for Democracy (NED) have long been cultivating would then be repeated almost verbatim throughout the Western press on Sunday - also predictably. It was stated on March 1 that, "It is important to keep in mind Freedom House president David Kramer's words, knowing that both the National Endowment for Democracy and Freedom House are self-serving frauds, when listening to these very same talking points regurgitated by the Western media during the elections this coming Sunday." The LA Times would feature an editorial by the Wall Street-funded American Enterprise Institute (AEI) titled, "Putin's Pyrrhic victory," which stated, "Putin's win "will be a Pyrrhic victory. Far from enhancing the Putin regime's legitimacy, the election will diminish it further in the eyes of a significant part of the Russian population." "...few, if any, regime changes, let alone revolutions, have been started by the majority. The majority has families to feed and a living to make. It is the younger, the urban, the better educated who have led successful modern revolutions. People who start them are getting uncensored news and opinions from the Internet and social media, not state-controlled television.And make no mistake about it: This is a young, middle-class revolt. " This frightening stamp of approval for lawless ochlocratic "regime change" would then be followed by a comparison to the now admittedly fraudulent US-engineered "Arab Spring." Joining the LA Times was a myriad of headlines regurgitating Freedom House president David Kramer's predetermined conclusions, with the Wall Street Journal reporting, "Putin Claims Election Win as Observers Claim Fraud," Fox News reporting, "Putin claims victory in Russia's presidential election amid allegations of violations in election," Reuters reporting, "Vladimir Putin 'elected Russian president', opponents allege fraud," and the London Guardian reporting, "Vladimir Putin's critics cry foul over alleged voter fraud in Russian election." Each report mentions either US-funded fraud Alexey Navalny or US-funded "independent election monitor" GOLOS, or both. Alexey was involved directly in founding a movement funded by the US government and to this day has the very people who funded DA! defending him throughout Western media. The mention of co-founder Mariya Gaydar is also revealing, as she has long collaborated, and occasionally has been arrested with, Ilya Yashin, yet another leader of a NED-funded Russian "activist" opposition group. 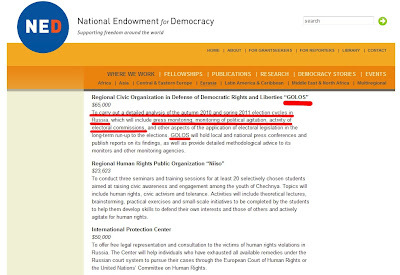 GOLOS, also mentioned endlessly by the Western media, is directly listed on the US State Department-run National Endowment for Democracy (NED) website as a recipient of funding. A NED subsidiary, the International Republican Institute (IRI), chaired by Senator John McCain, openly desires the ousting of Russia's president Vladimir Putin while the US State Department itself is publicly accused by Moscow of trying to incite unrest across Russia. It is then difficult to fathom how GOLOS can claim to be an "independent" poll monitor when they are funded by a foreign nation actively seeking to manipulate Russia's political landscape. It is also difficult to then understand why any reputable journalist would cite GOLOS as a reliable source of information, when clearly they are compromised. Difficult to understand, that is, unless one accepts that the Western media is nothing more than paid-propagandist serving Wall Street and London interests. The next step will be to fill the streets of Russia's cities with the NED-funded opposition's mobs of "young, educated urban youths," just as they did in Egypt. AEI's op-ed in the LA Times clearly states an intent to leverage a minority magnified through "social media" to enact "regime change." Whether Russia's security apparatus is capable of quickly and decisively dealing with this foreign-funded sedition, and how far Wall Street and London are willing to go are the only remaining variables that will determine the outcome of what was from the beginning the Wall Street-London "Arab Spring's" final destination. By understanding this process by which the neo-imperialists of Wall Street and London manipulate both domestic and international opinion through a clearly compromised media and network of disingenuous, insidious NGOs and "pro-democracy opposition" movements, this geopolitical gambit can be exposed and balked. The intended purpose of the US State Department is to maintain communications and formal relations with foreign countries - not project American hegemony around the globe. Meddling and subverting a sovereign nation is an act of war, and the potential conflict America's ruling elite threaten to trigger will be one paid for by the American people, not the corporate-fascists on Wall Street, or their proxies in Washington. Study and understand how the US State Department has manipulated and destabilized nations from the Middle East, to Thailand, and now across Russia through foreign-funded NGOs like GOLOS, and treasonous opposition movements like those led by Alexey Navalny, Vladimir Ryzhkov, and Boris Nemtsov. Then spread the word. A well-informed population is inoculated from crass, demagogic and ultimately self-destructive manipulation by a degenerate and dangerous ruling elite.